Looking to try something new when it comes to making chili? Why not swap beef for bison! Bison (also known as buffalo) is lower in calories and fat than beef. Also, most bison available in the US is grass-fed and pasture raised, resulting in a more flavorful meat. In addition, this recipe showcases diced sweet potatoes. They are higher in fiber and vitamin A than white potatoes. Optional toppings: hot sauce, sour cream, shredded cheese, cilantro, and sliced jalapeño peppers. Since ground bison is about 90% lean, you can substitute either 85% or 90% lean ground beef in this recipe. When cooking with tomatillos, prepare them by removing the paper-like husk and then rinsing thoroughly. They are coated in a sticky residue that should be washed before using. Per Serving: 345 calories; 16g fat; 24.5g carbohydrates; 26g protein; 76mg cholesterol; 353mg sodium. Made this with lean ground beef because the buffalo is sacred in our home (shrug). Maybe some textural difference, but I think it likely tastes just as good with that sub! The multipot managed to not turn the sweet potatoes into mush, which is a nice touch in this dish. I always struggle with them in stews. Added plain yogurt and hot sauce to mine, but YMMV. 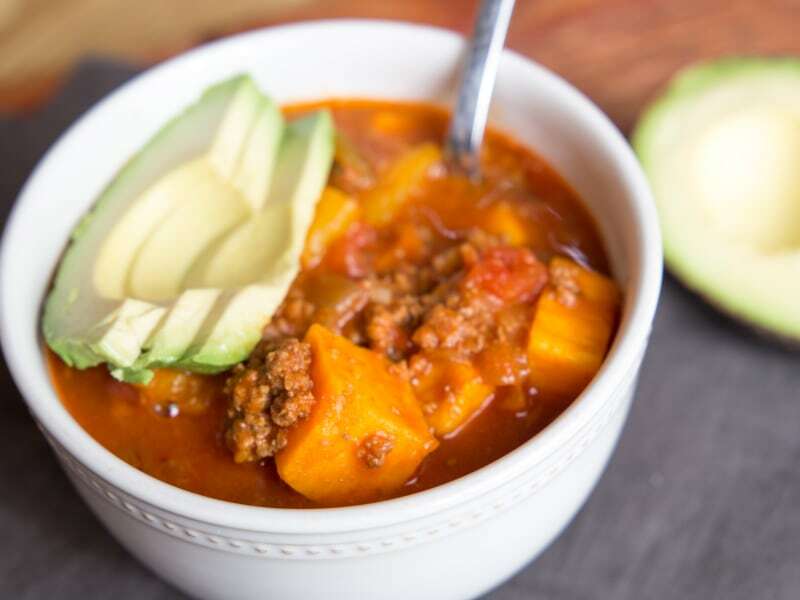 I am currently on a primal diet and this recipe is the perfect to get lots of high protein meat and seasonal veggies in. I recently switched to bison from ground beef and sometimes have to add in oil for a little more fat... there was no need in this recipe. Delicious, will be trying again! The sweet potatoes add sweetness to the rich, cumin and chili powder base. Bison is such a great lean red meat that is becoming more and more popular - see if your local store carries it! I've tried bison a few times at a restaurant, so when I saw this recipe I knew I had to try it at home! The flavor of this dish is so delicious, and slightly sweet. Definitely a new favorite! I swapped the sweet potatoes for black beans and kidney beans. I also added some coriander and used Mexican chili powder, an ingredient my family swears by. I loved using the ground bison, I think it has more flavor for sure. 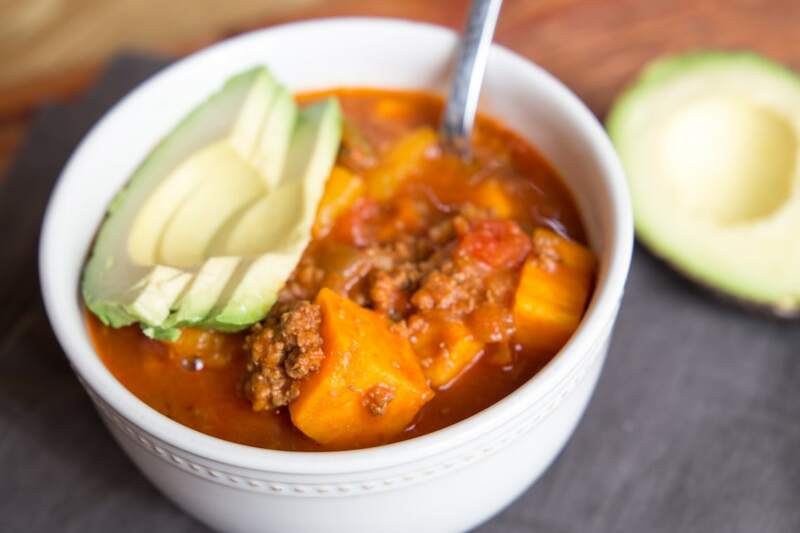 This is the first recipe I ever tried in my pressure cooker and it was some of the best chili we’ve ever had! I can’t believe how well the flavors meld together. It made so much that we froze the remainder. I’ve never been a huge fan of red meat but I’ll be craving this one again soon I’m sure! I did add a can of green chilis for a little extra bit other than that it was perfect! Do you have macros for this meal. I love it it was wonderful. Super delicious and easy to get prepped for pressure cooking. This is a new one for us and everyone enjoyed it (even a picky eater that doesn’t do vegetables).